The Ares I-X test flight vehicle began its slow roll toward Pad 39B at NASA's Kennedy Space Center at 12:39 a.m. CDT on October 20. 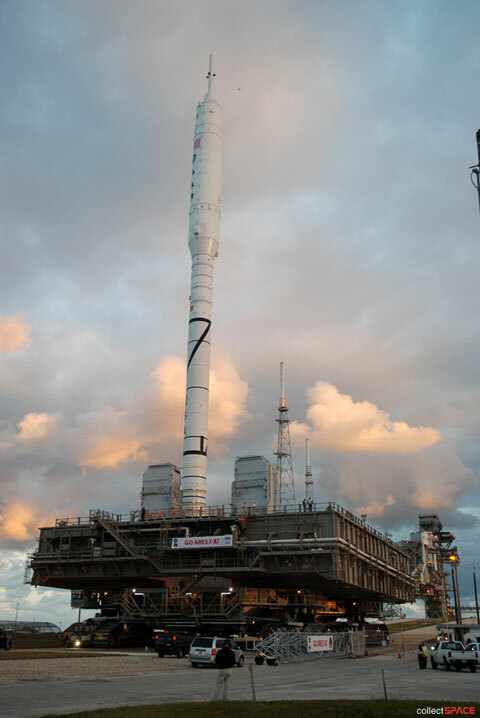 The 4.2-mile trip is expected to take about eight hours with the rocket arriving at the pad by about 8:30 a.m. CDT, where it will be prepared for its launch targeted for October 27. The total weight of the Constellation Program rocket, space shuttle mobile launcher platform, and Apollo crawler-transporter is 16 million pounds. 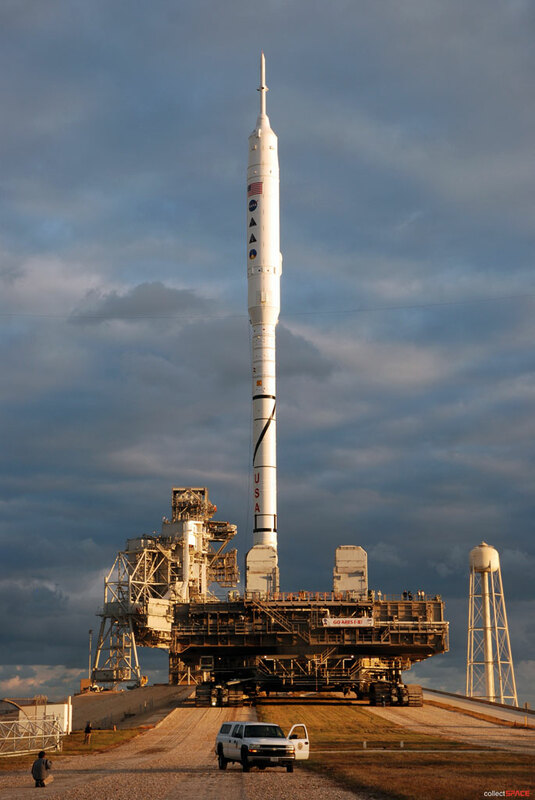 The Ares I-X test flight was designed to provide NASA with an early opportunity to test and prove flight characteristics, hardware, facilities and ground operations associated with its planned Ares I crew launch vehicle. Ares I-X reached Pad 39B at about 7 a.m. EDT and, atop its crawler-transporter, ascended the ramp to the pad surface. The mobile launcher platform with the rocket attached was lowered and secured on the pad at 9:17 a.m. EDT. 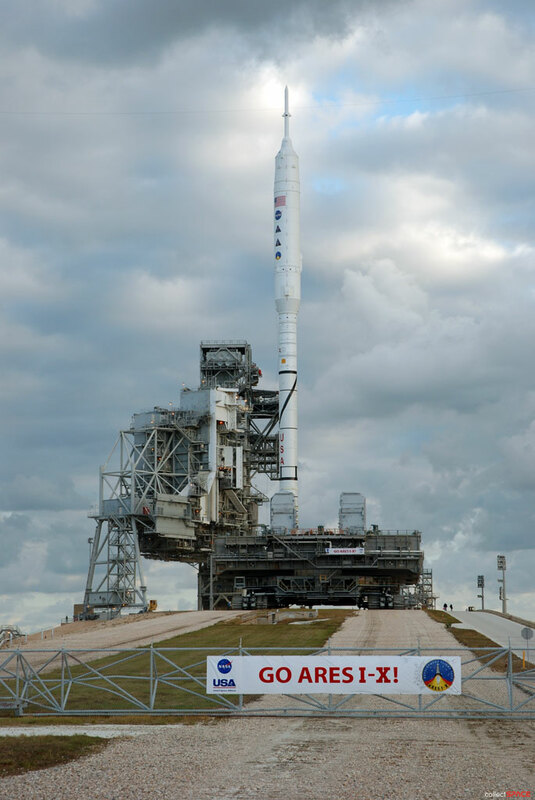 For the first time in more than a quarter century, a new vehicle is sitting at Launch Pad 39B at NASA's Kennedy Space Center in Florida. 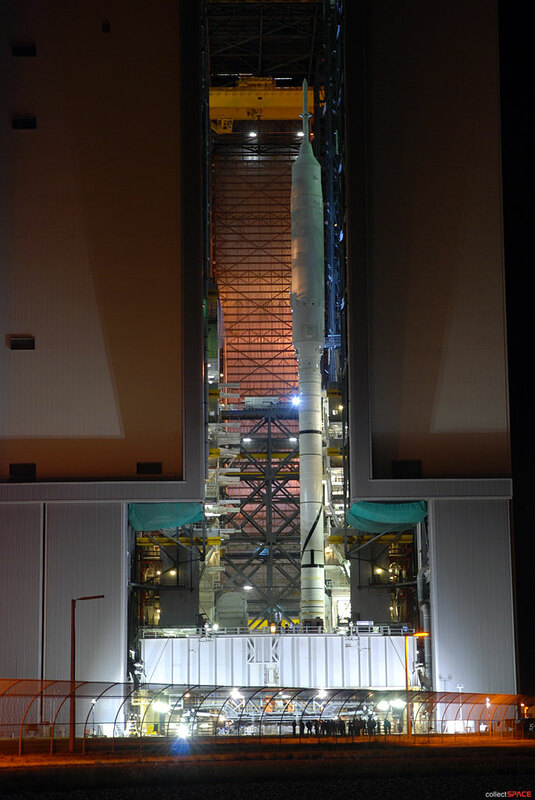 The Ares I-X flight test vehicle arrived at the pad atop of a giant crawler-transporter at approximately 7:45 a.m. EDT Tuesday. 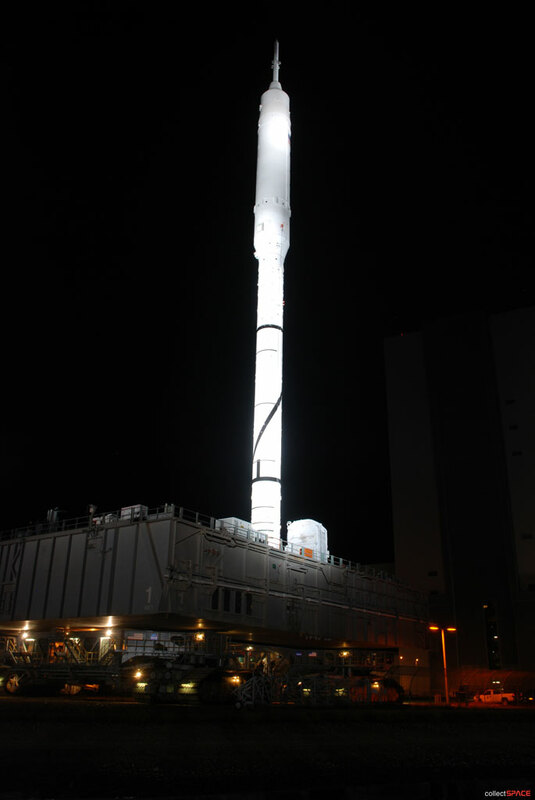 Ares I-X is an un-crewed, sub-orbital development test in a modified Ares I configuration. 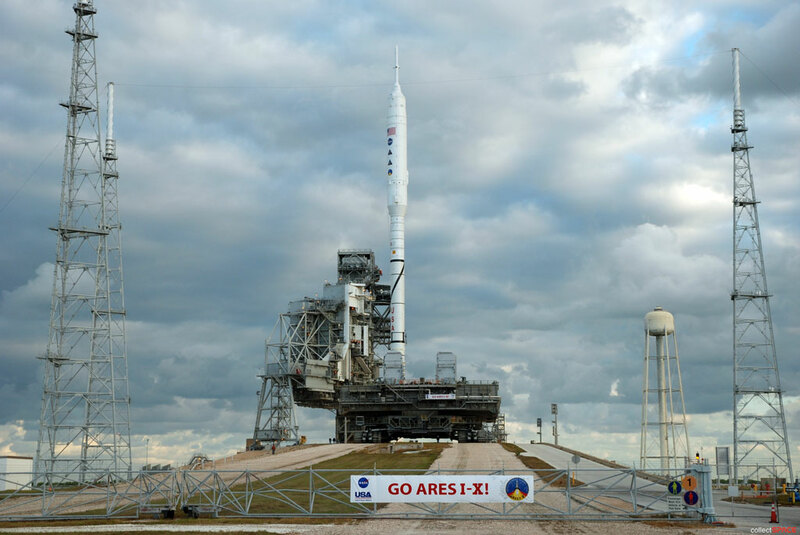 Ares I-X is the first developmental flight test of the Constellation Program, which includes the Ares I and V rockets, Orion and the Altair lunar lander. Does anyone else find the paint scheme on the first stage reminiscent of that on the Redstone missile test series? Thanks for the pics, Robert. Can't wait for the test. Yes! Finally, Ares I-X on its way to the pad. Great pictures. It's the beginning of a new era. Looking forward to the launch next week. 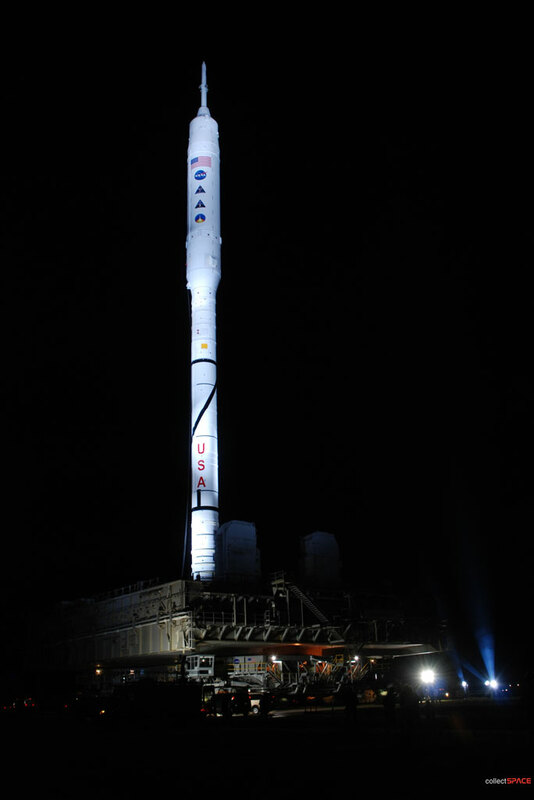 Looking at the vehicle, it kind of reminds me of the anticipation I felt for the launch of Apollo for the ASTP mission. I can't wait to see a photo of Atlantis and Ares I-X both on their respective pads. That will be an iconic transitional image. These pictures bring back feelings I haven't had since the early Apollo days. 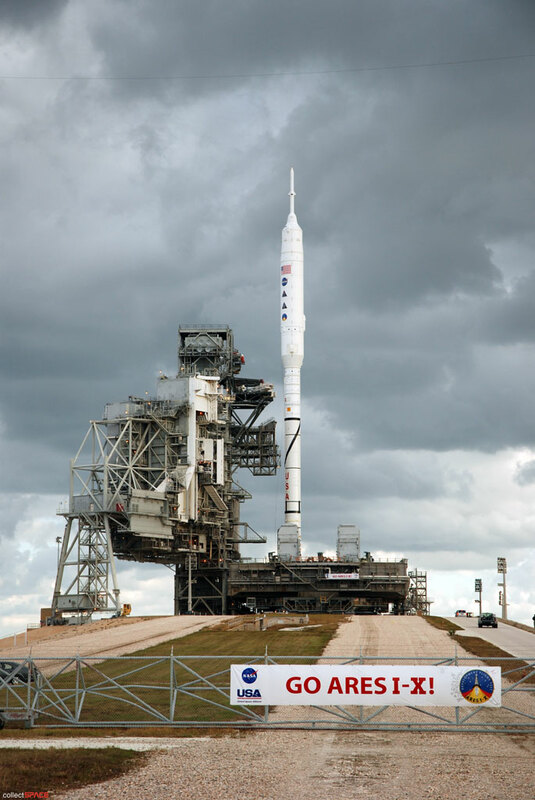 The anticipation of "going to the moon someday", the witnessing of Apollo in its early developmental stages, early Saturn I flights with the Pegasus satellites in the guise of block I Apollo stacks--I just wish the current popular culture was as excited now as we were then. If Ares I-X launches as scheduled on Oct. 27 it will do so on the 48th anniversary of the first Saturn I (SA-1) launch. I had forgotten about that! Wernher must be smiling somewhere! 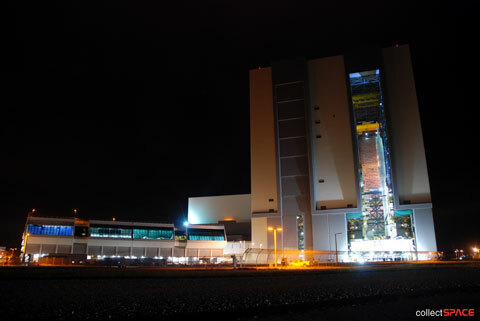 Point of fact is that the first rollout of a shuttle to the launch pad was Enterprise in 1979(?). That makes this one the first in thirty years! 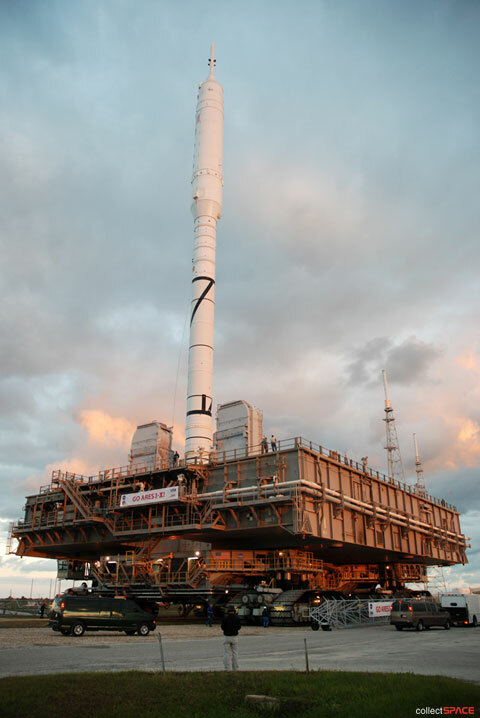 Correct, the first shuttle rollout here at Kennedy was the Enterprise OV-101 launch vehicle "stack" on May 1, 1979 as a "pathfinder" vehicle used for fitting and structural checkout tests to prepare the pad for the launch of shuttle Columbia OV-102. Orbiter Columbia, attached to her flight-ready fuel tank and twin solid rocket boosters, was first rolled out to Pad 39A on Dec. 29, 1980. The very first "rollout" occurred on May 25, 1966 with AS-500F, another "pathfinder" vehicle. But this one was of an Apollo Saturn V moon rocket that had a dummy Apollo spacecraft atop with no lunar module inside. Apollo 4 (AS-501) was the first "real" Saturn V launch vehicle rollout that was transported to Pad 39A on Aug. 26, 1967. It would take more than 13 months from the AS-501 rollout to when the first rollout of a manned mission, Apollo 8 (AS-503), would take place on Oct. 9, 1968. Still not a fan, but those are terrific pics, and I hope for a smooth flight. 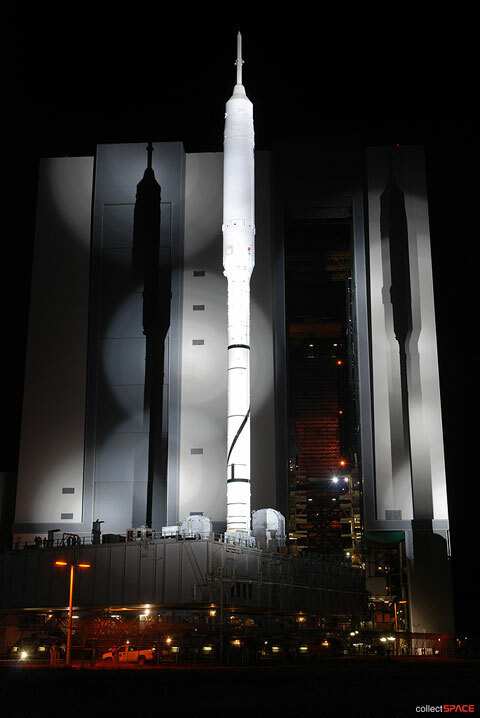 With credit to Wes Oleszewski, it is interesting to note that when Ares I-X rolled out, it weighed over three times as much as the Saturn V during the same activity. 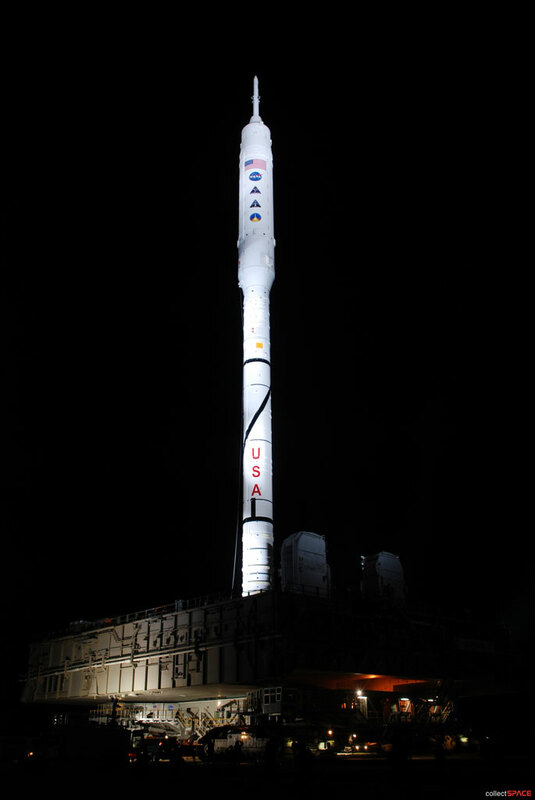 Total is 502,770 pounds (totals change slightly with different vehicles and missions), versus Ares I-X at 1.8 million pounds. 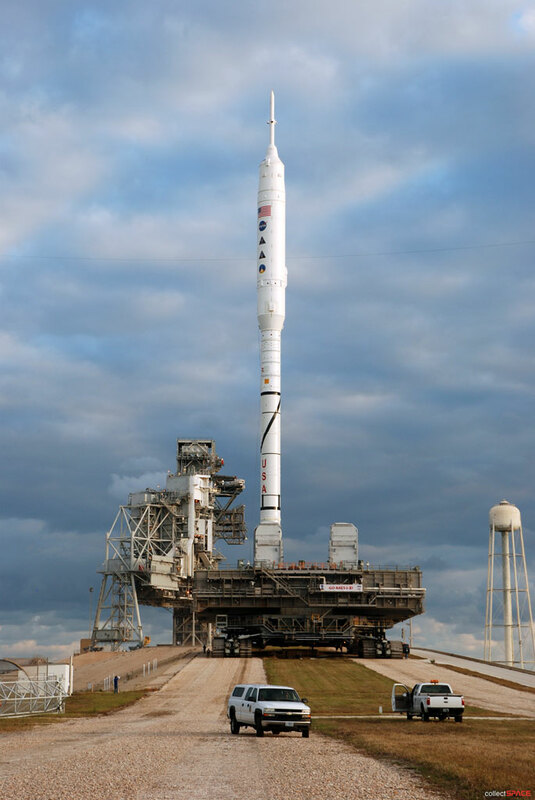 Of course, once at the pad, the Saturn V was loaded with 6.2 million more pounds of propellant. It's interesting to see that the MLP still has the shuttle hold-downs. 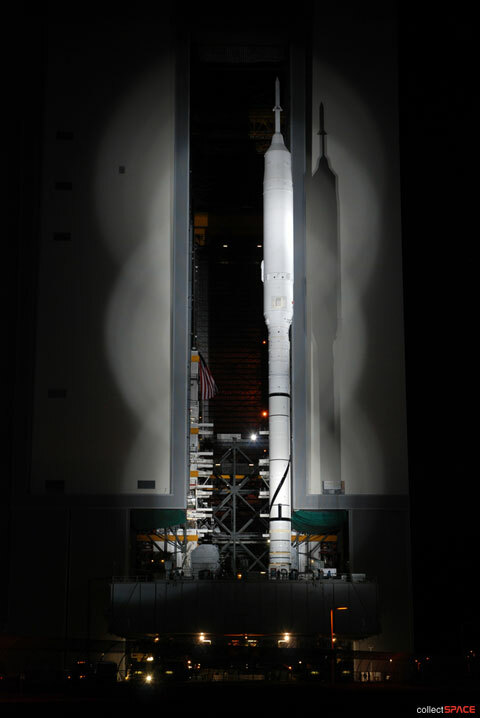 The Kennedy Media Gallery just posted several showing both Ares and the Shuttle in the same image.